Music Wings [H6527] - $7.00 : Yarn Tree, Your wholesale source for cross stitch supplies. Cross stitch chart from Imaginating. Designed by Ursula Michael. 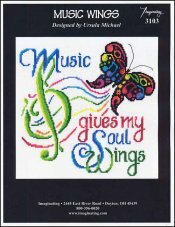 The verse "Music gives my soul wings" is accented by a treble clef and a colorful butterfly. Stitch count 123 x 132. Stitched on 14ct Aida white.